A typical warehouse has several entrances. 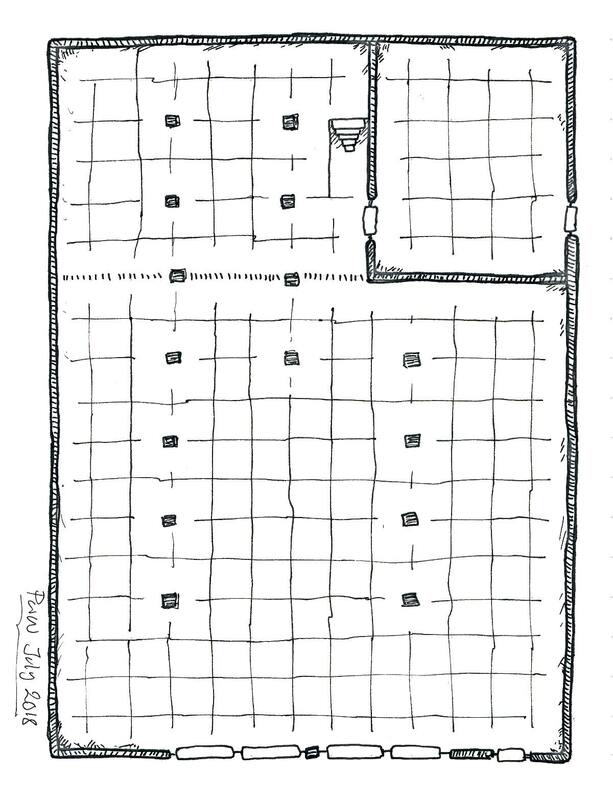 The main doors open to the main street or a courtyard and should be able to accommodate wagons. Side entrances for the central area and the office area are common. A proper sinister warehouse also has a trapdoor to the sewers and hatches to the roof. Careful climbers may use the hatches and railings to enter the building. The central warehouse area has a high ceiling, allowing stacks of crates that may require a crane to manage. Part of the loft is floored, and this is where the crane is located and operated. The warehouse has offices or smaller storerooms on both floors. The manager’s office and improvised bedroom are located on the second floor. The trapdoor to the sewer is located in the back, and the building is held together by pillars and bearings. The employees can walk on the bearings to access stacks of crates to handle goods, operate the hatches for ventilation, and to the roof for building maintenance. Move illicit goods through the city. Murder the city ruler and install a puppet. Hide fugitives from the authorities. Blow up city landmark as an act of terror. Recruit to a sinister cult or organization. Destabilize the city and instill rebellion. Corruption runs deep in the city. City Watch Involvement. Some guards run a side-operation from the warehouse. They torture and kill off-the-book prisoners, blackmail citizens, and sell confiscated contraband. Some even help foreign powers. Foreign Spies and Terrorists. Foreigners run spy and terror operations from the warehouse. They store alchemical fire and explosives in barrels in the back of the warehouse, and some of the paperwork implicate locals if the false cargo manifests can be discerned. Shallow Grave. A city high priest murdered and buried a spouse here. The city watch knows but dares not act. The deceased was buried with a recognizable wedding ring. The Serial Killer. The warehouse stands upon a more extensive, now forgotten complex, and the serial killer who recently appeared is looking for the entrance. The Slaver Ring. A slaver ring operates human trafficking from the warehouse. The victims are brought in and shipped off from the warehouse. Paperwork, rescued victims and interrogated slavers may reveal other slavers, suppliers, and customers. Thieves’ Guild Operation. A local thieves’ guild prepares jobs and ships of stolen goods from the warehouse. They keep plenty of shipping manifests at the warehouse, all forgeries. Dark Master. The warehouse owner’s vast wealth and influence are due to a dark sponsor, and tension rises as the bargain soon end. Demon Cult. A demon cult uses the warehouse for nightly meetings, training, and rituals. The warehouse has begun attracting undead and supernatural events outside the cult’s control. A demon guards the warehouse from the shadows. Undead Smugglers. Thugs running the warehouse smuggle undead to cultists or dissidents in the city, to be unleashed on an unsuspecting population sometime in the future. The stack of crates with wights are stashed in the back of the warehouse, the occasional scratching is blamed on the rats in the walls, and all the paperwork is carefully forged to lead to the local lord. Unstable Portal. Cultists once built a portal here, and it has remained unstable ever since. The warehouse has an unsavory reputation for murders and disappearances, not no one has found the cause. Some blame monsters from the sewers, but the truth is far more horrifying. Vampire Coven. 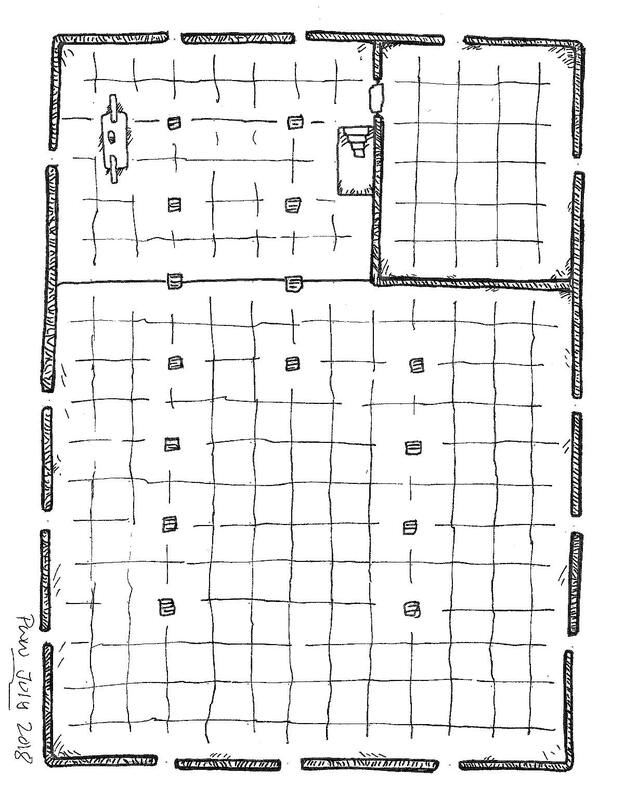 A coven of vampires uses the warehouse as a meeting place to deal with minions and quietly dispose of bodies. Charmed thralls and unwitting employees run the warehouse and guard its secrets, while the vampires hide in plain sight. Vengeful Dead. The warehouse is haunted, and the dead seek revenge for abuse and gruesome deaths. The city ruler sometimes visits the warehouse at night. Owner and thieves meet after closing hours, plotting a heist. The warehouse is turned into a nightclub for the city underworld. Rogues are interrogating a captive rival. Thugs are stacking stolen corpses for sale to necromancer apprentices or cultists.